Japan Airlines Corp, Jetstar Airways and Mitsubishi Corp confirmed plans to establish a LCC JV in the Japan market by Dec-2012. 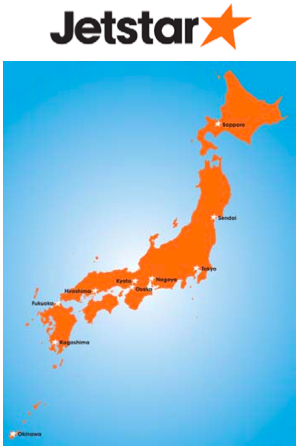 Jetstar Japan will be Japan's third new LCC announced this year, following hard off the heels of All Nippon Airways' announcement last month that it plans to establish a JV with leading low cost airline AirAsia, AirAsia Japan, in addition to its previously announced LCC, Peach. The JAL JV would add another piece to the complex jigsaw that is now transforming the Asian airline market. The potential market growth as these successive ventures are introduced can be measured in the hundreds of millions of new passengers. Removal of highly restrictive regulatory conditions and the scale of opportunities as new city pair market options emerge mean literally that the sky is the limit for growth upsides. Jetstar, with the announcement, is completing another piece of the Asia Pacific low cost airline subsidiary jigsaw puzzle, further growing its brand in Asia and gaining an increasing number of economies of scale in its operations. For JAL, the venture enables it to capitalise on recent developments in the Japan market to enable the diversification of its business model at a time of restructure for the carrier. As reported last week by CAPA, citing reports in The Nikkei, Jetstar Japan will target the Japanese leisure travel market, with the carrier aiming to “encourage more people to fly more often for less”. The carrier is planned to be based at Tokyo Narita airport, the base for AirAsia Japan, with a second base at Osaka Kansai, the base for Peach. Its domestic routes will initially cover Sapporo, Fukuoka and Okinawa, with Kagoshima, Hiroshima, Kyoto, Osaka, Nagoya and Sendai also named as potential domestic destinations, as per a Qantas presentation on 16-Aug-2011. An international network will follow within a year from launch, covering destinations in China, South Korea and Southeast Asia, including the Philippines. Looking further ahead, the carrier stated it would look at any destination within the A320 range - ie within four to five hours from Japan. The carrier could also potential operate other aircraft within the Jetstar/Qantas order book, potentially including B787 and A320neo equipment, as well as A330, in the future. The carrier will use the Jetstar brand as well as its operation, reservation and sales systems. A crucial part of the equation will be that Jetstar retains control of the operational side of the airline, given its experience in that area. Jetstar Group CEO Bruce Buchanan, in a press conference in Japan, stated the establishment of the JV marks a "very proud day" for the carrier. He noted that the key advantage of Jetstar Japan, over other competitors, is its understanding of the Japan market over the past four years, its ability to successfully generate ancillary revenue, its well-established distribution/selling model in the Japan market, and its unique heritage with and ability to codeshare and cooperate with full service operators, a legacy from its establishment out of a full-service operator. Mr Buchanan noted that airline partnerships will be for Jetstar Japan, as it has been with Jetstar Group, a "very important tool" for the carrier, with this to be an "important" and "critical success" factor for the carrier in Japan. He was also quick to stress that Jetstar is the "most profitable airline in the Asia Pacific" based on return of capital investment. The JV will initially be capitalised at around JPY3 billion (USD39 million), increasing to JPY12 billion (USD156 million) after the commencement of operations, but excludes the cost of aircraft. The three investment partners will each hold a third of the company in terms of voting rights, although Qantas and Japan Airlines will each contribute 42% of the total investment, with Mitsubishi contributing a smaller 16%. As per Japan regulations, foreign interests may not hold more than one third of a Japanese airline. Mitsubishi intends to lease, through its MC Aviation Partners leasing arm, the Airbus aircraft to be used by the new carrier. Mr Buchanan said the JV will now work towards establishing a competitive tender process for lessors. "There's obviously a lot of interest. One of the interested parties is also Mitsubishi, which is one of the shareholders. We'll be looking to go to the market to make sure Jetstar Japan gets appropriate financing. That could be anything from leases to all sorts of different financial structures." Although Mitsubishi has a majority stake in the Mitsubishi Aircraft Corporation, which is developing a 70-90 seat regional aircraft, Mr Buchanan said Jetstar Japan will not be swayed by parent company interests and will instead continue to concentrate on operating 180-plus seat aircraft. "There is no consideration to include the regional jets," Mr Buchanan said. "Our business is very focused on A320s and above. We have no intention of operating regional jets." Jetstar Japan will use the “diverse set of distribution options” already utilised by Jetstar in the Japan market. JAL President Masuri Onishi said the partnership with Jetstar is a two-airline strategy that will allow the Japanese carrier to competitively serve a larger part of the Japanese market. Jetstar first entered the Japanese market in 2007 and close to 2 million people in the Japan market have experienced the Jetstar product. In 2009, Jetstar was one of top 200 brands in Japan. Announcing the JV Qantas Group CEO Alan Joyce stated: “The Qantas Group has a long history of serving the Japanese air travel market, with Qantas and Jetstar operating regular services between Australia and Japan. Qantas and JAL have a long-standing relationship, as codeshare partners and fellow oneworld alliance members. We are also delighted to be joining with Mitsubishi Corporation - one of Japan’s great global brands – to launch Jetstar Japan, building on the successful expansion of the Jetstar brand across Asia. The Qantas Group has a wealth of experience in establishing low cost carriers and we’re looking forward to working with our two partners on this new venture which will offer low fares to the Japanese travelling public". JAL, which significantly reduced routes and staff under bankruptcy protection, is increasing codeshares and tieups with other airlines to boost its network. On the Qantas-JAL JV, JAL President Masaru Onishi commented: “We are confident that Jetstar Japan will broaden the spectrum of travellers as it creates new demand in this market. It will encourage even more movement of people within the country and also increase the number of visitors from Asia to Japan. We anticipate this to stimulate consumer spending and play a role in revitalizing the Japanese economy. Jetstar’s entrance to Japan, as a proven successful low cost airline operator, will revitalise our domestic air transportation market. That is the reason for our participation, and we would like to support Jetstar Japan’s success in Japan as well as eastern Asia with our variety of services such as aircraft leasing". A joint venture between Qantas' low cost subsidiary Jetstar and JAL has been on the cards since JAL's bankruptcy over 18 months ago. At that time, the proposal, from Qantas, was part of a bid to ensure that JAL remained in oneworld; SkyTeam's Delta was making strong overtures to the carrier to switch allegiance. As CAPA reported earlier this month, Jetstar Airways had commented that JAL “jumped at this opportunity" to be involved in the carrier's expansion of its Asia Pacific operations through the JV structure. Japan Airlines President Masaru Onishi, at a Press Conference in Japan on 16-Aug-2011, confirmed that the two carriers commenced talks back in May-2008 and have been involved in "intensive" discussion for the past 12 months. Mr Buchanan in Feb-2011 told Jiji Press that the carrier was continuing discussions on the LCC partnership with Japan Airlines. In late Jan-2011, the CEO stated the carrier was “in the final stages” of negotiations with more than one Asian carrier to launch an LCC joint venture, with a geographic focus on North Asia, according to reports in the Australian Financial Review. 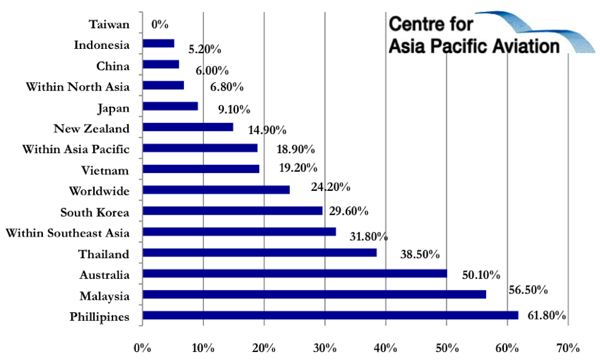 Targeted regions included Japan and China, where LCC penetration remains relatively low. Mr Buchanan at the time stated talks with JAL for the launch of an LCC JV were “progressing”, although he added “things in Japan take some time”. Reports have suggested that, apart from the usual need to accommodate union requirements, issues between the two managements concerning the respective shares and effective control were proving difficult to agree. Qantas Group has long had a close relationship with Japan Airlines, which today includes codeshare arrangements on Jetstar and Qantas international services between Australia and Japan. JAL and Jetstar in Nov-2010 reached an agreement to expand their codeshare partnership to include services operated by Jetstar on routes linking Japan's two major cities - Tokyo Narita and Osaka Kansai – with Queensland's Gold Coast. JAL has been a bilateral partner of Jetstar since May-2007. JAL also markets services operated by Jetstar that connect Tokyo Narita and Osaka Kansai with Cairns. The enhanced codeshare agreement placed Gold Coast on JAL's network map alongside Adelaide, Brisbane, Melbourne and Perth that were already served by codeshare services with Qantas Airways over Singapore. The move to establish a Jetstar-JAL LCC was floated in 2010 although JAL Chairman Kazuo Inamori in Oct-2010 stated he had reservations about delving into discount airline operations. "I think we should refrain from chasing after scale expansion. Look at the US example, where many low-cost carriers that entered the market have since exited," he said at the time. JAL President Masaru Onishi around the same time however stated the carrier would consider the creation of an LCC as part of its restructuring programme, commenting: “There is a lot of interest in low-cost carriers and we will research the issue and decide how to proceed". Mr Onishi stated a potential LCC would be a “Japanese-style low-cost carrier”, although it would need to avoid the high operating cost structure characteristic of Japan’s carriers, which have long-standing problems such as high labour costs. Going back even further, in Nov-2009, amid the jostling between oneworld and SkyTeam related to Japan Airlines’ membership, Qantas pledged to advise the carrier in successfully establishing a low-cost offshoot, as it has successfully done with Jetstar. Qantas, with its “dual brand” structure, is perhaps the ideal partner to advise on establishing an LCC subsidiary, as the Jetstar model, working closely with the mainline Qantas, has been a highly successful model. While the Japanese market conditions and route structures are very different from the climate in which Jetstar grew up, there is plenty of experience that Jetstar’s founders could offer to JAL. Jetstar has been a lifesaver for Qantas, both in fighting off low-cost competitors and then in expanding the Qantas Group’s market. Qantas now uses Jetstar to substitute for it on long-haul routes from Australia, where the mainline carrier’s cost base makes operations unviable. The subsidiary, for example, recently took over the key Sydney-Tokyo Narita route for Qantas, protecting the valuable slots from being lost to competitors. Apart from the possibility of supporting JAL into a successful LCC subsidiary, courtesy of Jetstar’s experience and support, there are clear potential advantages for both carriers if a successful venture were possible. A stand-alone JAL LCC, working with Jetstar, would itself offer advantages for both sides. For example, Jetstar is highly connective, codesharing and interlining not only with its parent, but is open to others as well, notably members of the oneworld alliance. Working jointly to support each other would alone deliver strong market presence. And a joint venture – which offers a lower-risk option on both sides – is a useful solution, with considerable potential for expansion. The advantage for oneworld would be in a tighter long-term linkage into the Japanese flag carrier. 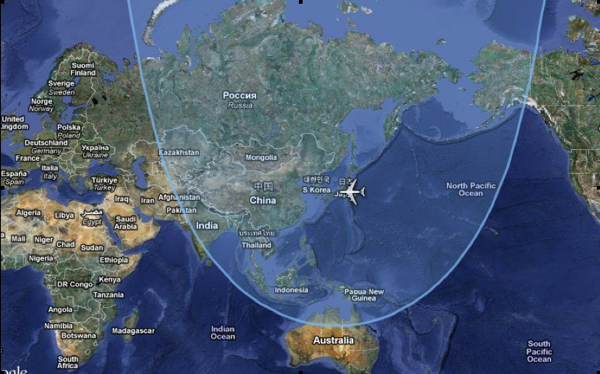 For Jetstar specifically, gaining access to the massive Chinese market via Japan would help link the Qantas subsidiary very effectively into an evolving pan-Asian network. Meanwhile, All Nippon Airways (ANA) has announced plans to enter the LCC market in recent weeks, with not one but two LCCs, imposing increased urgency for JAL to respond, or be left out of what is now a comprehensive scheme of full service carrier low cost subsidiaries across the region. With these JVs announced, ANA President Shinichiro Ito stated the carrier was now "fully prepared for intense competition" in the Japanese market among other LCCs. "It is necessary to gain an advantage by moving ahead of rivals," he added. As part of its LCC strategy, ANA is launching what will be Japan’s first full-service low-cost subsidiary airline, “Peach”, after beginning serious preparations to enter the LCC market three years ago. The carrier expects its Peach subsidiary to exploit new demand, targeting a different customer base from its full service operations and operating out of Kansai Airport where ANA has only a limited network. When Peach takes to the skies, it will operate with 10 A320 aircraft leased from GE Capital “to tap regional demand for leisure travel”. Scheduled to commence operations in Mar-2012 with domestic services between Kansai and Sapporo and Fukuoka, the airline aims to be carrying 6 million passengers by 2015, by which time it was to have a fleet of 15-20 aircraft and operating international flights to key Asian destinations, including major cities in China and Taiwan. The carrier’s first international destination was to be Seoul in May-2012. Peach, in which ANA has a 33.4% stake, was expected to turn a profit on an annual basis in three years and clear away accumulated debt five years after the launch. ANA subsequently announced on 21-Jul-2011 that it planned to to form a second JV LCC with AirAsia, to be called AirAsia Japan Co. The carriers expect the JV airline, which will be the first LCC to be based at Tokyo Narita International Airport, to commence operations in Aug-2012, subject to regulatory approvals. AirAsia Japan will be AirAsia's first venture outside Southeast Asia. AirAsia will hold 33% of the voting shares and 16% of the non-voting shares in the JV through its wholly owned subsidiary AA International Ltd, while ANA will hold the remaining 51%. The JV will require an initial capitalisation of JPY1 billion (USD12.7 million), of the authorised capital of JPY5 billion (USD63.4 million). Mr Ito, as quoted by Dow Jones, stated the plan is for AirAsia Japan to be profitable within the first year of operation. "We are targeting profitability from the first (fiscal) year of operation. Our challenge is to achieve profitability as early as possible," Mr Ito said. For ANA, the agreement will further the airline's efforts to be the dominant player in the Japan market, both in the full service and LCC arenas, using AirAsia’s experience and low cost business model to serve the high potential markets of Japan and Northeast Asia. Mr Ito said the the two new partners came together because of rising “turbulence” in a growing and increasingly complex Asian airline industry. He said rising competition in Japan had posed a “big threat” to ANA that it was seeking to turn to its advantage by joining forces with AirAsia. he also believed it was "only a matter of time before discount airlines eat into the shares of established carriers" in Asia. The ANA-AirAsia announcement changes the nature of the Peach operation, which, it is suggested now, will focus on Chinese mainland markets. However, it is clear that the AirAsia Japan operation, operating out of Narita and bearing the ubiquitous AirAsia brand, will be potentially much more powerful. Japan's aviation market has undergone rapid transformation with developments including the expansion of Open Skies agreements - notably with the US - and increased domestic competition from road and rail-based travel. In addition, Tokyo Narita International Airport, a major international hub serving Tokyo, is increasing capacity with the introduction of a new terminal and is expected to attract many LCCs and foreign airlines. Narita now has the space and slots to pursue LCCs because last year's expansion of Tokyo Haneda resulted in a shift of some long-haul flights to Tokyo's closer-in and previously domestic-only airport. The total pool of slots at Narita is also expected to increase by 40% in 2013, with a large portion of the new slots likely to be allocated to LCC carriers. AirAsia and ANA have stated they are “optimistic” that the LCC market, which is currently underserved in Japan, will “be as well received in Japan as has been is in ASEAN”. The rationale for the JV is to bring “low cost airline travel to Japan to make it affordable to the average Japanese national to travel both domestically and regionally”. Mr Ito, earlier this week - also quoted in The Nikkei, stated AirAsia Japan will have costs which are "less than half" of its full-service parent but more than double those of AirAsia's Malaysian operations, at around JPY6 (USD 7.77 cents) per ASK. The operating costs will be impacted by higher personnel costs and landing fees in Japan. They will, however, be lower than other operators in the market, including Skymark Airlines. The JV aims to offer fares which are one third to one quarter of what existing international carriers charge and expects aircraft to operate with load factors of more than 80%, Mr Ito said. He added that "the reservation and other systems we plan to use are those of AirAsia's" which will also help minimise costs. For now, ANA has the inside running, with two LCC ventures in the works. The ANA-AirAsia announcement in particular is a very positive development for a market which has been crisis-ridden in 2011. Next year is shaping up to be a massive year for the LCC sector in what has been a sleepy North Asian market. LCCs still only operate around 2.7% of the 3000 weekly international services to/from Japan at present. LCC penetration within Japan also remains very low, at 9.1%, although this is higher than the intra North Asia LCC penetration rate of 6.8%. Mr Buchanan has noted that this situation creates a number of opportunities for Jetstar Japan, with the carrier not seeing any problems in filling its 24 aircraft in such an underserved market. CAPA has estimated that, with aggressive low cost carriers in the market and substantial liberalisation of access in the Japan-Korea-North China triangle, an additional 20 million passengers a year could be travelling annually - such is the density and economic evolution of the sub-region's urban markets. If allowed to fly unrestricted between regional gateways, there are other independent LCCs in the market such as Skymark and China's Spring Airlines that also have the potential to generate very high levels of growth. The new LCCs will only enter progressively, but just the knowledge that they are on the way will dramatically shift the very cautious mindset that has kept Japan's aviation system the most expensive and under-exploited in the world. Meanwhile, the new moves firmly entrench the LCC model in North Asia. Korea's full service airlines each have relatively timid versions of low cost subsidiary, but previous attempts by branded independent LCCs to establish local JVs have been rebuffed. What is now happening in Japan will create even more powerful agents for change, and not just for Korea, but also for China, which has been very reluctant to allow local establishment of LCCs - even though foreign branded LCCs now operate actively into the Chinese market.